We discuss some of the considerations that go into choosing a threaded fastener in this episode of The Engineering Commons podcast. It can be more complicated than you might think! Carmen has a tendency to make up words every now and then; this leads to quizzical reactions from his co-workers. For many years, Jeff has used the Machinery’s Handbook as his reference for most issues related to threads and threaded fasteners. We let slip a million-dollar idea; a blank book that lights up with content when turned on. How many years until this becomes a reality? The primary reason for using a threaded fastener is to allow for the assembly and disassembly of components. If disassembly is not required, one might be better off by welding, soldering, brazing, riveting, swaging, or casting components together. 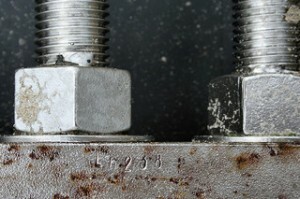 Common threaded fasteners include bolts, screws, nuts, and studs. Despite the differing definitions about what constitutes a screw and what constitutes a bolt, we go with a distinction in usage: a bolt needs a nut, while a screw does not. When selecting a screw or bolt, one usually starts by looking at the strength needed in two places; the fastener itself, and the threaded connection. Plain washers are used to distribute forces that might deform or mar one of the clamped components. Lead is the linear advance of threaded fastener as it makes one complete rotation about its longitudinal axis. Pitch is the spacing between adjacent threads on a threaded fastener. “RightTighty, Lefty Loosy” is a mnemonic device for remembering which way to turn a threaded fastener so as to tighten or loosen the connection. Measuring the diametric distance across the tops (or “crests”) of an external thread reveals the “nominal” or “major” diameter of that thread. A notation of “M10 x 1.5” designates a thread that has a major diameter of 10 mm, and a lead of 1.5 mm. While metric fasteners identify the lead directly, English threads give the inverse of the lead. Thus, the notation “1/4-20” indicates a thread having a major diameter of 0.25 inches, and 20 threads per inch (a lead of 0.05 inches). In the United States, the primary thread reference is the Unified Thread Standard. Most of the world uses the ISO standards for thread forms and sizes. When selecting a threaded fastener, it’s good practice to use a coarse pitch unless you have a good reason for not doing so. Fine pitch threads are normally reserved for those cases when vibration might tend to loosen the threaded connection. In the American system, sizes below 1/4 inch are identified by numbers that decrease as the nominal diameter decreases. External threads may be machined or rolled; internal threads on machined parts are typically drilled and tapped. A rule of thumb is that the axial thread engagement should be at least 1x the nominal diameter for steel, 1.5x the nominal diameter for cast iron, brass or bronze, and 2x the nominal diameter for aluminum or zinc. A “blind” tapped hole allows for an internal thread that doesn’t go all the way through a component. Many different head types are available in threaded fasteners. A countersink is a cone shaped hole, while a counterbore is a flat-bottomed hole. Establishing the proper preload is an important part of designing a threaded connection. The bolting process can be modeled as going through the stages of rundown, alignment, elastic clamping, and post-yield. Much of the torque applied during bolt tightening goes to underhead and thread friction, rather than bolt preload. One means for determining proper bolt torque is the turn-of-the-nut method. Jeff’s father taught him the criss-cross method for tightening bolts in a circular pattern. Thanks to Scott Robinson for use of the photo titled “Jetty Bolts.” Podcast theme music by Paul Stevenson.